Made for Windows Media Player XP version, the skin is fully animated. 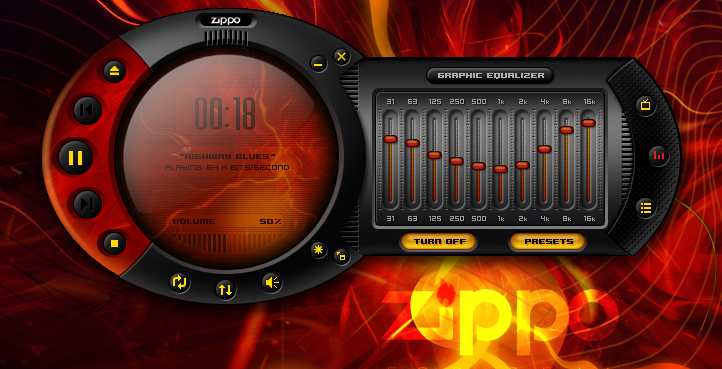 WindowBlinds, IconPackage, wallpaper and WinAmp and Windows Media Player skins. Whoa! I couldn't ask for a better birthday present...... just phenomenal!!!! Thank you. What can I say, I love zippo lighters, been collecting them for many years. Got the file this time.... AWESOME!!!! This got me using WMP again. Excellent work. I hope to see more media player skins in the future! The window highlight staying on top of the visualisations is a nice touch too. OMG!!! Please help! everytime I try to download it says cannot find the specified file!?!? Good God man, this is like torture! Oh man! Thank you so very much, too freakin sweet. Again thank you kindly for your help. fantastic, but when i do "open file" it shut down. This is absolutely marvellous! Is there a suitable cursor set to go with the suite?